Renting a Shed or Storage Unit—Which is Better? If you’re torn between renting a shed or a storage unit, this post will help you decide which is the best option. You may have more things than you do storage space but you don't want to spend the money to buy a shed or clean out the attic to create a little extra room. Maybe you own a small business that needs more square-footage, but you’re not ready to commit to a larger facility or sending out RFPs to contractors for expansion estimates. In both cases, a non-permanent solution would meet the need. And the answer to the problem could be a rental unit or a rental shed. There are pros and cons to each option. Here’s a little about both. Whether you're moving, need a place to store excess furniture or seasonal items, or require ongoing storage for your business, a self-storage unit could work perfectly. Most rental units are well-lit, clean, secure, and open 7 days a week. And that’s just a few benefits; here are a few more. Easy access. Most provide plenty of space to move around. That may be wide hallways for easy access to interior storage units or wide pathways for trucks and larger vehicles for those using outside units or storage lots. Climate control. If you have items that need to be kept at room temperature or in a moisture-free environment, most storage companies offer units that meet these requirements. Storage for both big and small items. You’re not limited to spaces that remind you of your hall closet. From storage lockers to large expansive lots for RVs, there are many different sizes from which to choose. Easy online payment options. Most businesses now take online payment. Gone are the days of sending in checks or paying in person. Stay current by keeping up with payments from the convenience of your personal computer. The downside to self-storage units is that they are away from your home. This means you have to drive to them every time you need something that's stored inside—which is less convenient and often results in infrequent trips and the greater chance that what's stored will be used less than if it were closer to you. Also, many storage companies have defined hours which means they may not be open on holidays. And, if you get behind on your payments, you're items may be removed! While rental units are often convenient solutions, they’re not the best storage solution for everyone. If a rental unit doesn't meet your needs, consider renting a shed. If you need a short term or long term storage option, want the best value for your money, have a tight monthly budget, living somewhere temporarily, or require a convenient storage solution quickly, renting a shed may be your best option. There are many reasons why renting a shed might be the right choice for you. For instance, if you need more space for your business—more room for inventory, temporary office space, or utility storage— you can pick one that suits your needs and have it delivered to your location. You don't have that kind of flexibility with a storage unit. Maybe you want a convenient backyard shed at the home you’re renting, this is a great way to stay in budget and keep your property looking nice. 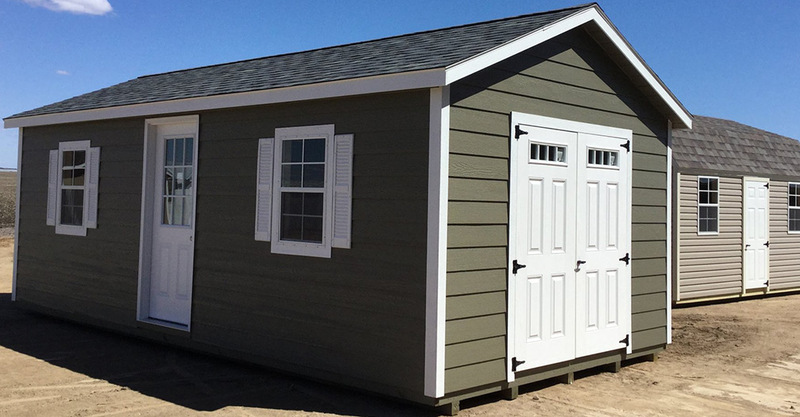 You can get a durable, high-quality storage shed in your very own backyard or delivered to your business with our affordable Shed Rental Program. Having a shed in close proximity means you won't waste fuel driving back and forth from an overpriced rental unit. And choosing a shed and having it delivered to you is easy. To view our sheds available for rent, click on the location nearest you. Delivery is free within a 20-mile radius of each site. Life is demanding and full of choices. We’d love to make just one aspect of your life a little easier. That’s why it’s our mission to provide products that are built well, worth every invested dollar, and to offer customer service that’s worthy of word-of-mouth recommendations. We care about helping you organize your life, assisting you as you look for the best storage solution for your needs, and making the purchasing process as easy as possible. That’s why we manufacture quality outdoor storage structures in an environment of care and respect, for the safekeeping of people’s possessions and to help organize their lives. Learn more about renting a Dakota Storage Buildings' shed. Keep your shed and your life organized. Here are some helpful articles. Our posts cover insights into our storage buildings, creative ways to use sheds and garages, practical storage tips, and useful how-to guides.